Mr. Willy Fautré, co-founder and director of Human Rights Without Frontiers, and Associate Editor of Bitter Winter, delivered the following text, illustrated with slides from pictures of persecution published by Bitter Winter, during the seminar Freedom of Religion in China organized at the European Parliament in Brussels by Mr. Bastiaan Belder, Dutch representative for the European Conservative and Reformists Group (ECR), Mr. Cristian Dan Preda, Romanian representative for the European People’s Party (EPP), and Mr. Josef Weidenholzer, Austrian representative for the Progressive Alliance of Socialists and Democrats. The former panelists have exposed various facets of China’s persecution of Protestants, Catholics and Muslims. 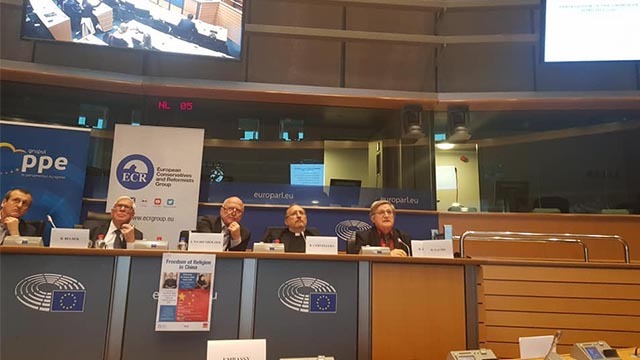 Marco Respinti has explained you how Bitter Winter, a unique news agency covering violations of religious freedom of all faiths in China on a daily basis, was created and is working with its network of correspondents inside and outside China. I will briefly focus on other religions that are also persecuted in China and that Bitter Winter is monitoring: Buddhism, Taoism and so-called xie jiao, “heterodox” religious movements, such as Falun Gong and The Church of Almighty God. Buddhism is a state-sanctioned religion and should enjoy the protection of the state. It is known that Tibetan Buddhists who are followers of the Dalai Lama are particularly persecuted but the repression now also targets Buddhism outside Tibet. In a matter of five days, from 28 October to 1 November 2018, 35 Buddhist temples and memorial temples built to commemorate prominent people in the city of Xinmi alone (Henan province) have been either shut down or sealed off, including one ancient temple that had existed since around the 6th–7th century. The eradication of any visible presence and activity of Buddhism in the public space is a priority for the CCP, such as the removal of a temple’s banner on top of a pole as this slide shows. But religious symbols are even removed from inside religious places and photos of Mao Zedong or Xi Jinping are even hung on the walls to assert the total allegiance to the CCP. Numerous Buddhist and Taoist temples throughout China have been sealed off or demolished, leaving the elderly monks and believers who lived there with nowhere to go. These devout believers find their lives suddenly uprooted, with no companionship and no security for their survival. The suffering these religious people endure is heartbreaking. For example, a Buddhist temple in Xinzheng city (Henan province in central China) was sealed off in September. Authorities claimed that it did not have a permit to operate. All residents were prohibited from living in the temple, and the water and electricity supply were cut off. As a result, more than a dozen monks and nuns were forced to leave the temple. With nowhere to go, one Buddhist nun in her seventies, who had lived for 20 years in the temple, goes on living secretly in the temple. As there is no water supply, she must walk more than 1 kilometer every day to fetch some water and must burn firewood to cook meals. At night, only when it is necessary, she carefully lights a candle to provide illumination. Taoist believers are also being hit hard by temple closures. On 14 August 2018, Bamboo Forest Temple, an ancient Taoist temple in Huayin city of the northwestern province of Shaanxi, was demolished by the authorities on the grounds that it was in violation of building regulations. The monks, usually very old, were expelled from their temple. They shared the same fate as the Buddhist monks, having nowhere to go. Authorities also ordered the destruction of the Yaochi Palace Temple, an ancient Taoist temple, because it supposedly “violated building laws,” the pretext often used by officials to crack down on religious meeting venues in China. The Yaochi Palace Temple has a thousand-year history. Falun Gong, a well-known large Chinese new religious movement, established by Li Hongzhi in 1992, was originally tolerated and even praised by the CCP as part of a legitimate revival of traditional Chinese health practices. However, it created concern in the authorities because of its rapid growth. It was banned in 1999, included in the list of heterodox religious movements named xie jiao, in December 2000 and severely persecuted. It is No. 1 on China’s black list of xie jiao. The usual sentence for active members of a xie jiao movement is three to seven years in prison. Our organization has documented more than 2000 individual cases of prisoners belonging to that movement in China. Established in 1991, The Church of Almighty God (CAG) is one most targeted religious movement in China. According to official Chinese sources, their members number around 3 million. It is No. 2 on the black list of xie jiao. Many believers and leaders of the Church have been persecuted in the past two decades after it was officially designated as a xie jiao, in 1995. According to Article 300 of the Chinese Criminal Code, being active in a xie jiao organization may result in a prison sentence of three to seven years. However, the authorities are stricter on CAG, and many members of the Church receive lengthier sentences. At present, the longest prison term received by a CAG leader is 15 years. In early December, in one week alone and in one province (Heilongjiang), the authorities mobilized a large police force and launched a mass arrest operation against members of the CAG: 52 of them were arrested. In Liaoning province, 795 CAG members were arrested in June and in Jilin province, 256 CAG members were arrested in 16 cities. Our organization has documented more than 1600 cases of prisoners belonging to that new church. In June last year, five senior leaders of The Church of Almighty God from Shandong, were sentenced to heavy prison terms and fines: 13 years and the equivalent of 19,000 USD for a woman named Bao Shuguang, 12 years +17,000 USD for three, and 11 years + 16,000 USD for one. Between April and October 2018, the Chinese Communist Party regime arrested at least 3,000 CAG believers across China. Church leaders are often tortured in secret jails during interrogations and while serving their heavy prison sentences. 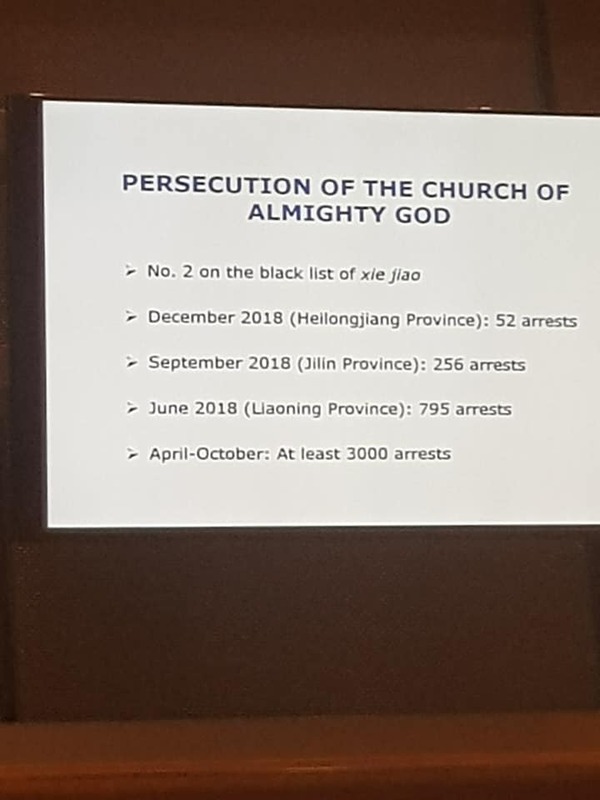 More and more members of The Church of Almighty God who are persecuted or under threat of being arrested, are looking for a safe haven outside China and want to be recognized as political refugees. We have recorded more than 2500 cases in the European Union. Unfortunately, despite the magnitude of the persecution and concrete data publicized by Bitter Winter and other news agencies, few of them are granted political asylum. The worst pupils of the class in Europe are France, Netherlands, Belgium and Switzerland who respectively issued 203, 33, 10 and 24 orders of departure. Those peaceful believers might be arrested at any moment at home or on the street, sent back to China and put back in the hands of their persecutors. In the name of atheism, which is the official worldview of the CCP, China is oppressing all religions. Chinese citizens of all faiths are victims of arbitrary arrest and detention torture and other cruel, inhuman or degrading treatment or punishment extra-judicial killings. In the name of atheism, believers are allegedly “re-educated” in detention facilities until they recant their religion or swear not to practice it any more. In the name of atheism, they are pressed under coercion to adopt atheism as their worldview.